Man Built A 2-Storey Wooden House As Wedding Gift To Son. An ingenuous father built a two-story wooden house with his bare hands as a wedding gift for his son. This is a wonder, in this day and age, when more and more modern buildings are being built with reinforced concrete. Zheng Zhongfu is a 54-year-old carpenter from Huxian County in northwest China’s Shaanxi province. He learnt carpentry as a profession from his father at the age of 17. With the expertise gathered over the years and the tragic earthquake in most parts of the country, he developed an idea of building a house with wood. Both father and son searched online for instructions on how to successfully build a 2 storey apartment using only wood. Determined for adventure, they started preparations for the project in 2012. The family spent four years modifying and improving the design until this year 2016. 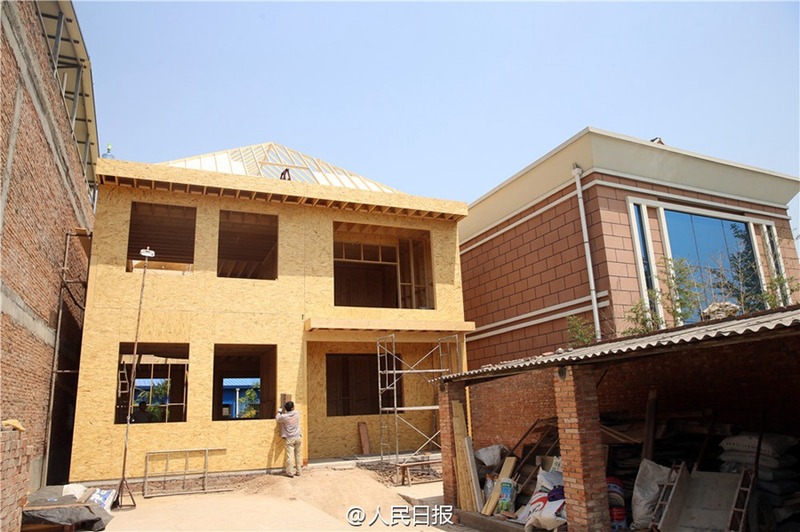 The actual erection of the 300-square-meter house started this year and has been successfully completed. Reports say Zheng’s younger son is about to get married in October, so he plans to make the house a wedding gift. His daughter-in-law is said to be very excited and can’t wait to move into the masterpiece. However, some architectural experts are expressing concerns on the functionality of a wooden house. They agree that wood is better when it comes to insulation, environmental concerns and soundproofing but is also flammable and can be easily destroyed. 2 Comments on Man Built A 2-Storey Wooden House As Wedding Gift To Son.